Click to display the Minister Preferences page. 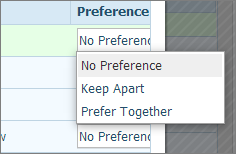 Select the Family Preference tab. This tab lists all of the ministries and ministry groups your family is signed up to serve in. If the Schedule Members at The Same Events? option in the top left is set to Yes (the default), members of your family are always scheduled to serve together at the same events. No Preference: (the default) specifies that family members who are qualified to serve in the ministry are scheduled as needed ("don't care) for the same event. Keep Apart: ensures that when two or more family members are qualified to serve in the ministry, they are never scheduled together at the same event. Prefer Together: ensures that when two or more family members are qualified to serve in the ministry, whenever possible, they are not separated at the same event. 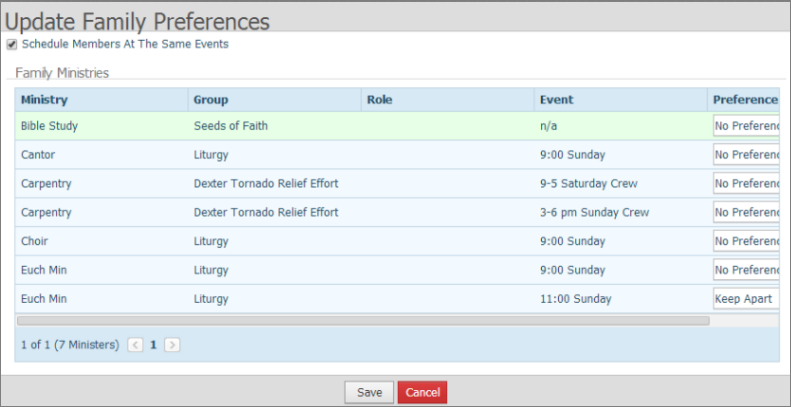 If you do no require all members of your family to serve together at the same events, uncheck the Schedule Members At the Same Events box in the top left. When done, click to save your changes. You return to the Minister Preference page. The Minister Preferences list is updated with all of the changes you made.